A widget that provides a single line edit. To act upon editing, connect a slot to the keyWentUp() signal because the keyPressed() signal is fired before the line edit has interpreted the keypress to change its text. You may specify a maximum length for the input using setMaxLength(). If you wish to provide more detailed input validation, you may set a validator using the setValidator(WValidator *) method. Validators provide, in general, both client-side validation (as visual feed-back only) and server-side validation when calling validate(). The widget corresponds to the HTML <input type="text"> or <input type="password"> tag. WLineEdit is an inline widget. The emptyText style can be configured via .Wt-edit-emptyText, other styling can be done using inline or external CSS as appropriate. If echoMode() is set to Normal, and no input mask is defined, this returns the same as text(). If an input mask is defined, then the text is returned including space characters. If echoMode() is set to Password, then a string of asterisks is returned equal to the length of the text. Returns the maximum length of text that can be entered. 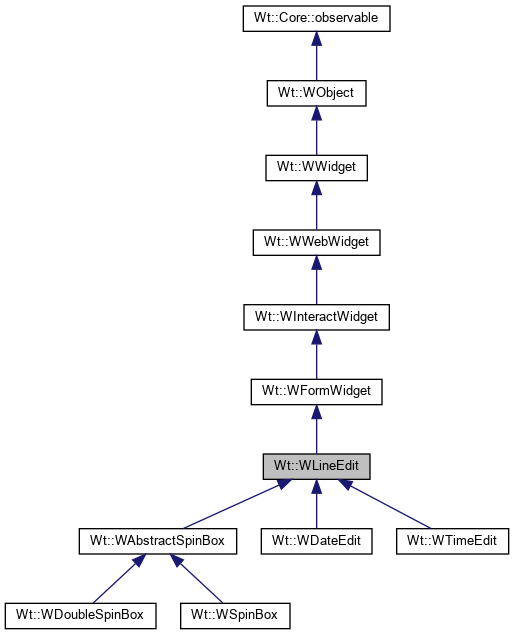 Reimplemented in Wt::WDateEdit, Wt::WTimeEdit, Wt::WDoubleSpinBox, and Wt::WAbstractSpinBox. Sets (built-in browser) autocomplete support. Depending on the user agent, this may assist the user in filling in text for common input fields (e.g. address information) based on some heuristics. The default echo mode is Normal. If no input mask is supplied, or the given input mask is empty, no input mask is applied. The distinction between required and optional characters won't be apparent on the client side, but will affect the result of validate(). A backslash ('\') can be used to escape any of the mask characters or modifiers, so that they can be used verbatim in the input mask. If the mask ends with a semicolon (';') followed by a character, this character will be used on the client side to display spaces. This defaults to the space (' ') character. The space character will be removed from the value of this WLineEdit. IP address. Spaces are denoted by '_'. Will validate if there is at least one digit per segment. Date, in yyyy-MM-dd notation. Spaces are denoted by ' '. Will validate if all digits are filled in. MAC address. Spaces are denoted by '_'. Will validate if all hexadecimal characters are filled in. All characters will be formatted in uppercase. Specifies the maximum length of text that can be entered. A value <= 0 indicates that there is no limit. Selects length characters starting from the start position. Specifies the width of the line edit in number of characters. This specifies the width of the line edit that is roughly equivalent with chars characters. This does not limit the maximum length of a string that may be entered, which may be set using setMaxLength(int). Returns the current width of the line edit in number of characters.